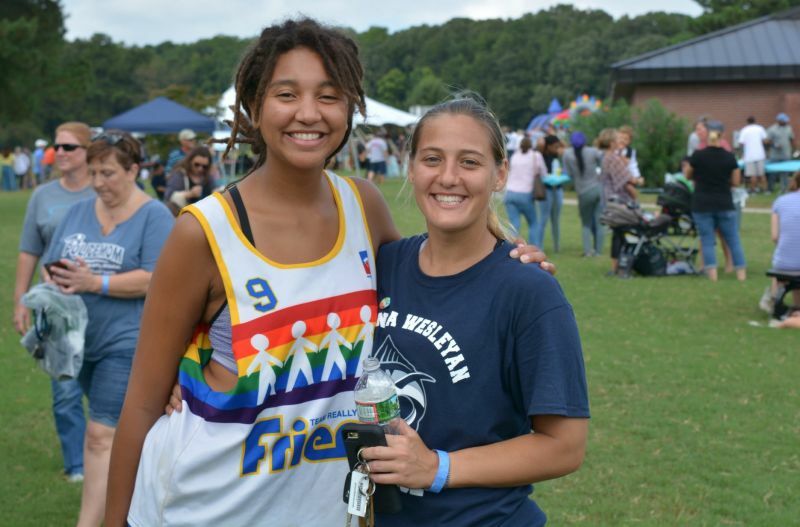 Tradition, togetherness, and team spirit were front and center during Virginia Wesleyan’s 2018 Homecoming and Family Weekend. Marlins came home October 5-7 to celebrate the University with three days of events. Earlier in the week, on October 3, VWU supporters near and far showed their love for the University as part of Marlin Spirit Day. Each fall on the Wednesday prior to Homecoming, alumni, students, and friends wear their Wesleyan and show their pride by posting a photo on social media with the hashtag #MarlinSpiritDay. 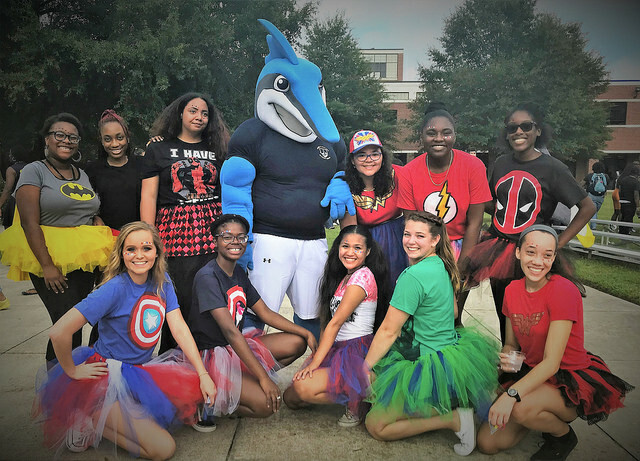 The superhero-themed Homecoming Parade, hosted by the Student Government Association, took place Friday afternoon on the sidewalks of University Commons. That evening featured an Arts Showcase with select performances from all areas of the performing arts, a volleyball match in the Jane P. Batten Student Center, the Friday Night Flights Alumni Social, and the annual Homecoming Dance. Homecoming continued on Saturday with a tree planting ceremony behind Godwin Hall celebrating the life of women’s basketball alumna Nancy Kelly ’15. Coach Stephany Dunmyer, Professor Soraya Bartol, and other friends offered emotional, uplifting tributes in Nancy’s honor. On the other side of campus, participants hit the ground running for the first-ever EDGE 5K Fun Run, a race sponsored by Aramark with proceeds benefiting the VWU Excellence Fund. Travis Harrington won the race for the Male Division and Joanne Potter took home the trophy for the Female Division. Conference Athletic Games were also part of the action Saturday, with a field hockey game against Roanoke College and women’s and men’s soccer versus Ferrum College. Annual Alumni Games brought back Marlins from women’s and men’s lacrosse, women’s basketball, and a baseball/softball co-ed slow-pitch game. Audwin Harris ’20 and Dazjae Johnson ’21 were crowned Homecoming Court King and Queen during halftime of the field hockey game. The NCAA Division III Softball Champions Ring Ceremony took place during the women's soccer game, and VWU President’s List and Dean’s List athletes were honored during the State Farm/VWU Scholar Athlete Recognition ceremony at halftime of men’s soccer. The Homecoming FinFest took place on Trinder Center Lawn with a picnic-style lunch and food trucks and drink from J&K Style Grill, Ynot Pizza, Malbon's BBQ "The Flying Pig", Kona Ice, and Hoffman Beverages. The RTB Band performed as kids enjoyed inflatable bounce houses and others took in glass-blowing demonstrations by the Chrysler Museum of Art’s Mobile Glass Studio. Winners of the Second Annual Chili Cook-off were Amber McDonald ’19 (Grand Prize and Student category), John Aird (Alumni category), Alicia Tasz and Amy Rush (Faculty/Staff category). A Music & Theatre Panel was held in Hofheimer Theater on Saturday afternoon, as current arts faculty joined Dr. Rick Hite, Professor of Theatre Emeritus, and Dr. Stephen Mansfield, University Archivist, for a retrospective of VWU programs. Night two of the Arts Showcase featured additional performances spanning arts disciplines. Homecoming and Family Weekend was brought to a close on Sunday with a Christian Homecoming Worship in Monumental Chapel, featuring Rev. Ted Smith ’84.